Frankincense, also called â��Olibanumâ��, is an aromatic resin obtained from trees of the genus : Boswellia, particularly Boswellia Serrata(in India). Due to its classical fragrance it is used in incense and perfumes. 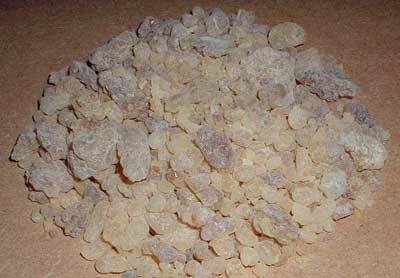 Frankincense resin is edible and often used in various traditional medicines in Asia for digestion and healthy skin. It is often light yellow with a (very) slight greenish tint. It is often chewed like gum, but it is stickier because it is a resin. In Ayurvedic medicine Indian frankincense (Boswellia serrata), commonly referred to as "dhoop," has been used for hundreds of years for treating arthritis, healing wounds, strengthening the female hormone system, and purifying the atmosphere from undesirable germs. © Copyright 2012. Herbex Exports Pvt. Ltd.